After a childhood studying classical ballet and modern dance, the Michigan native left home when she was 18 years old to attend Hendrix College in Arkansas. There she discovered the timeless songs of the Ozarks and the Delta and devoted herself to songwriting, founding the Little Rock Songwriters Circle in 2003. 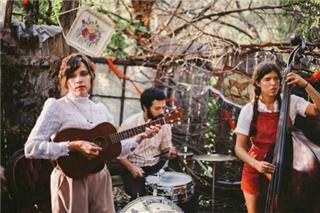 In 2004, she moved to Austin, TX and joined the indie folk band Peter In The Wolf for a stint. Soon though, Dana broke away to focus on her own music: stripped-down songs inspired by dreams, memories, and landscapes. 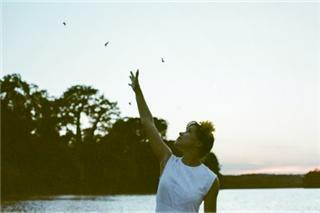 Falconberry self-released her Paper Sailboat EP in 2006 and followed it up with 2008's more electrically produced Oh Skies of Grey. In 2010, she returned to a more sparse and organic sound with her album Halletts, featuring tight harmonies provided by Gina Dvorak and Lauren McMurray. She followed the release with extensive touring, including several runs through the United States and trips to Europe and Japan. For 2012's Leelanau, Falconberry was determined to push herself as a songwriter while staying true to the sound and aesthetic that had earned her a growing fan base in Austin and beyond. While previous recordings emphasized the sparse and delicate, on Leelanau, Dana's fairy-like voice is bolstered by the exquisite orchestration of a six-piece band (Dvorak, Karla Manzur, Matthew Shepherd, Christopher Cox, Lindsey Verrill) who are central to the bountiful soundscapes Falconberry creates. The newly developed string arrangements (arranged by bandmember Cox and performed by Austin's Tosca String Quartet) match the growth in Falconberry's songwriting approach: I used to write more about love and heartbreak, but I find now that I am more interested in complex ideas and subtle emotions rather than the sweeping melodramatic stuff. Leelanau is an ode to rural Michigan with references to stories both real and imagined, a travelogue of both places on the map and of complex emotions stirred by memory. Themes of regret and estrangement are balanced by expressions of youthful joy and discovery, with many songs using real locales as starting points and interweaving the human experience with the world surrounding it. These forgotten memories leave tangible traces for us to rediscover as our lives go on, a concept summed up in the title track, a fable of a woman long lost in the woods, with her family finding traces of her journey for years to come. Copperleaf tells the story of two people who were very close friends as kids, reunited after years of divergent paths, with their love remaining but much more complex and daunting. Elsewhere, the song Sleeping Bear (based on a Native American legend of the same name) captures the despair of a mother bear who after escaping a fire by swimming across Lake Michigan, waits in vain for her two cubs who drowned on the way. In Pictured Rocks, a red fox laments that he's only brought you grief, while a Crooked River finds redemption and relief in losing itself and flowing into the sea. For the recording of Leelanau, Falconberry and her newly formed band sequestered themselves in a gospel church-turned-recording studio in east Austin, essentially moving in. We would start working in the morning, get through the list of things we needed to record for the day, and play with ideas until the wee hours. There was a ton of creative energy flying around," Falconberry says. To say that the songs were rooted in places and visuals is no overstatement; Dana made prints of scenes for her bandmembers to study while recording their parts, like visual aids. Leelanau was recorded by Grant Johnson, mixed by Danny Reisch (of Shearwater), and produced by Johnson, Cox, and Falconberry. The same session also produced Leelanaus acclaimed four-song prelude EP Though I Didn't Call It Came, released on Sacramentos Crossbill Records in January 2012. Falconberry is thriving musically in her new hometown, heralded by the Austin Chronicle as one of the city's most arresting female vocalists and in 2011 she starred in the critically-lauded documentary on the Austin music scene, Echotone, a New York Times Critics' Pick. In addition to her solo work, Dana has worked extensively with her contemporaries, frequently collaborating with Matt Bauer (Brooklyn) and most recently providing backing vocals for the Heartless Bastards (Austin) for their spring 2012 tour. She has shared stages with Okkervil River, Shearwater, Megafaun,Father John Misty and Dr. Dog, captivating audiences with her powerful live shows. Falconberry has retained the Leelanau band to bring the songs to life on stage, receiving praise far beyond Austin's city limits. In addition to extensive tours through the US, Europe, and Japan, Dana has recorded two Daytotter sessions and a Laundromatinee session for My Old Kentucky Blog.